Due to the growth experienced in the past few years, parking has gotten a bit cramped. That is why we’ve received permission from the City of Ennis for runners and their families/friends to park their vehicles at Veteran’s Memorial Park, which is right across from the event’s staging area (Lone Star Fitness). 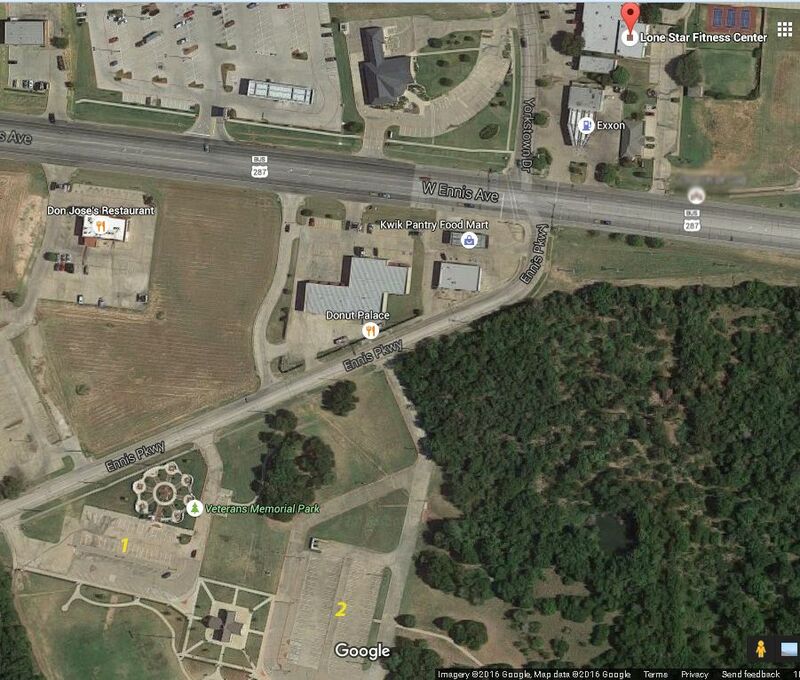 There are two parking areas at the park – one right near the memorial itself (marked as 1) and one closer to the concession building (marked as 2). We’re encouraging everyone to try and park in the concession building parking so as to not interrupt any visitor traffic to the memorial itself. To get from Veterans’ Memorial Park Concession Building Parking to Lone Star Fitness, simply walk north via Ennis Parkway to the Yorkstown/West Ennis Avenue Intersection. There will be an officer from the Ennis Police Department directing traffic at the intersection to allow foot traffic to cross (the intersection has traffic lights as well). Awards : 5:45 to 6:45 a.m.
Polkafest Run benefits Ennis Rotary Club project. The Children's Reading Program at the Ennis Plublic Library is the primary beneficiary of the race proceeds. We gratefully thank our gold sponsors! Copyright © 2019 Polkafest Run. All Rights Reserved.